We think most of them, including the Milky Way, formed something like 13 billion years ago, condensing out of truly vast clouds of primordial gas. The details are a tad complex, but some settled into puffy spheroids, some flattened into disks, and others, usually smaller, never really took on much of a shape at all (which is why we call them irregulars). But even after that, some changed, grew. They do this by eating other, smaller galaxies, or colliding and merging with bigger ones like themselves. The Milky Way grew this way, and in fact is cannibalizing several smaller galaxies even today, so many eons after it was born. An interesting thing is that the speed of light is finite. That's not a non sequitur! Because of this, when we look at objects very far away we see them as they were when the Universe was young. So when we look at galaxies that are 10 billion light-years away or more, we're seeing them when they were a few billion years old, and so it's like having a time machine into the cosmic past. The problem is that they're so ridiculously far away we can't see them very well; even a huge galaxy is apparently shrunk down to teeny tininess by such terrible distances. Finding a big primordial galaxy nearby would be quite the boon. But it's so unlikely! After all this time, you'd think every big galaxy would have eaten so many smaller ones that it would have changed considerably since its youth. You'd think. But then there's NGC 1277. This beauty is very, very interesting. New research just published indicates that it is indeed a big, nearby, primordial galaxy! And that's very, very strange. Why? It's located 240 million light-years away (so, kinda sorta nearby, at least to galactic astronomers), right in the middle of one of the largest galaxy clusters in the local Universe! The Perseus Cluster is a true behemoth, containing well over a thousand galaxies. It's so crowded and busy there that galaxy collisions are common… making it the last place I'd expect to find a pristine galaxy, unchanged since the dawn of the cosmos. However, the thinking here is that it's protected because it lies near the huge galaxy NGC 1275 (aka Perseus A), a massive elliptical galaxy at the cluster's center of mass. NGC 1275 is undoubtedly a gourmand, having eaten most of the available galactic fodder around it. 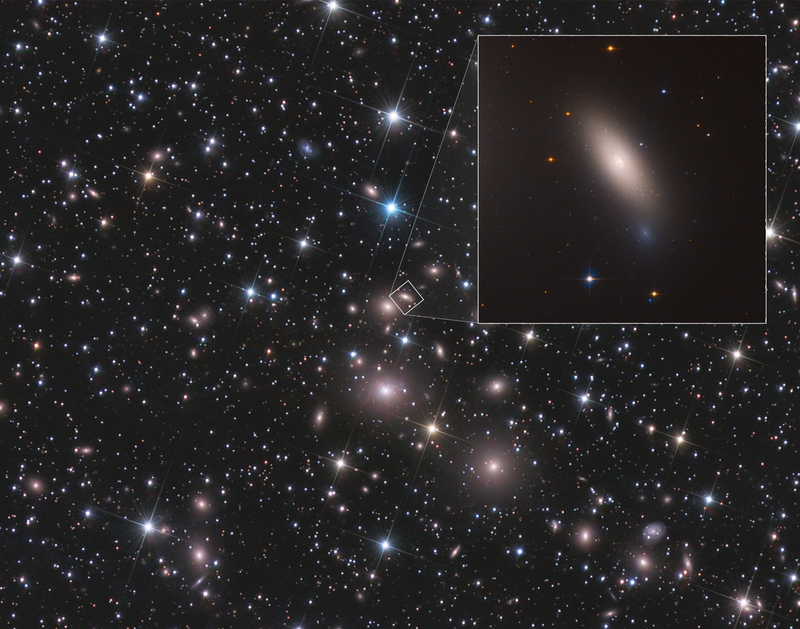 Because of this, NGC 1277 has been starved of smaller galaxies to eat. How do we know NGC 1277 is so untouched by age? For one thing, even at a glance, the galaxy is odd. The distribution of stars in it is very smooth, despite being a disk galaxy. Usually, galaxies that are flattened (like our Milky Way) have spiral arms, but NGC 1277 doesn't seem to show any indication of them. That means it likely hasn't formed stars in a long, long time (the gas clouds in star-forming galaxies accentuate spiral arms). This commonly happens to disk galaxies in clusters; as they move through the space between galaxies the gas and dust inside them can get blown out by a process called ram pressure (like when you're driving in a car with your dog and your pet makes an unfortunate odor; you roll down the window and let the rapidly moving air blow the fetid miasma out). Not everything is gone; you can see a dark band of dust curved around the center of the galaxy in the image above. But it does look like it's severely depleted in gas and dust. But there's more. The new research focused on globular clusters around NGC 1277. These are tightly packed balls of hundreds of thousands of stars, held together by their own gravity. It's thought that many form along with the parent galaxy as the protogalactic gas condenses, and these tend to be very old (obviously) and red. But some come along later, when the big galaxy eats smaller ones and takes on their globulars as its own. These tend to be bluer, having formed under different circumstances. And that's the key point: Most of the globulars surrounding NGC 1277 are redder. That implies NGC 1277 hasn't eaten very much; the astronomers estimate only about 10% of its mass in stars comes from cannibalism. That's far lower than for most big galaxies. 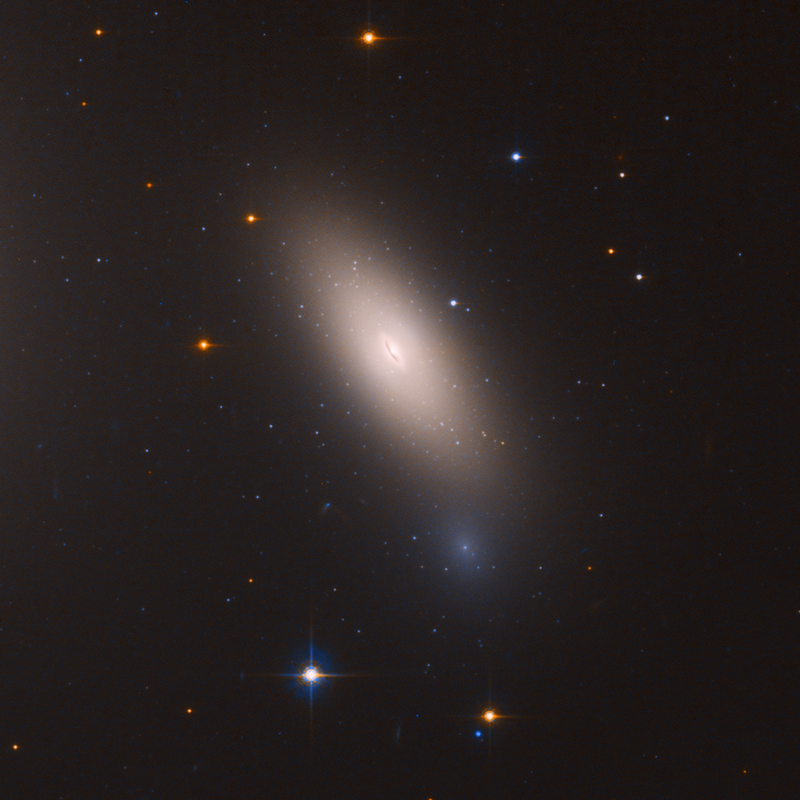 For example, NGC 1278, a galaxy not far from 1277, is about the same size and mass, and it has lots of blue globulars, indicating it has eaten many smaller galaxies. So for some reason, NGC 1277 appears to be unique. And that's lucky for us! Because it's close enough for telescopes like Hubble to see clearly, we can identify individual globular clusters in it, and see it enough detail to examine it well. If it were billions of light-years away that would be significantly more difficult. As it is, it's been studied quite a lot, and has proven useful in understanding how galaxies form and how they evolve. Or in this case, don't evolve. One more thing: As I was looking at the images, I thought the galaxy looked familiar, and sure enough, I wrote about it in 2012 when it was discovered that NGC 1277 has an overly massive black hole in its very center. Every big galaxy does, but the one at the heart of NGC 1277 is something like 12 billion times the mass of the Sun [Note: In the original article I wrote that the mass is 17 billion solar masses, but newer measurements indicate 12 is closer to the real mass.] The one in the middle of the Milky Way is a meager 4 million solar masses, a fraction of a percent the mass of NGC 1277's. Not only that, but NGC 1277 isn't a huge galaxy, just sort of a middleweight one, so the ratio of the black hole mass to the rest of the galaxy is far higher than other galaxies. Wondering if there were some connection, I contacted the authors of the new research, and they confirmed my suspicion is correct: NGC 1277 likely formed like a normal galaxy, developing a core and a supermassive black hole, but after a few billion years it stopped growing, and never ate any other galaxy. Because of this, the ratio of the mass of the black hole (which formed early on) to the rest of the galaxy is abnormally high. In fact, a few other "relic" galaxies show the same sort of thing. So the new observations of the globular clusters supports this idea as well. NGC 1277 isn't alone in this way, and the authors plan on using Hubble to observe some of these other galaxies and see if their globulars are, on the whole, redder than usual. If so, then this will again lend more credence to the idea that these galaxies have remained relatively untouched for eons. And if not? Well, that's science. If your hypothesis is wrong, then that means more interesting things are waiting to be learned. That's cool, too.